I’m not important to you! Well how often have you heard that one from your significant other? Maybe your feeling like you’re no longer the most important thing in your partner’s life, that the relationship you’ve built isn’t the priority anymore. Maybe you feel like you’ve been pushed aside and other things have taken your place. I hear this all the time! It’s probably one of the most common challenges I run in to when relationship coaching. The order of our priorities can change focus for many reasons and can also be affected by the seasons of our lives. For instance, kids could be taking priority right now or the care of an ill parent or maybe even work responsibilities have unavoidably increased. More often than not, though, this is a pattern that one or both of you has fallen in to over time. You don’t necessarily fight but you don’t necessarily connect either. You aren’t taking the time to talk beyond when each of you will be home for supper or when the kids next soccer game is being held. You aren’t spending time nurturing each other or your relationship. You’ve fallen in to parallel lives and daily routines. Now, ask yourself this… Why are you even in this relationship? I mean, do you love your significant other or what? Well of course you do! You’ve just lost sight of it amid the details of daily life. Relationships are a two way street; both partners want to feel loved and needed all of the time, not just some of the time. If your the only one giving love, but you aren’t feeling it in return, how can the relationship succeed? Are you doing everything you can to make your partner feel important? Are you doing what you can to make your partner feel special? Are you doing everything you can to make your partner feel like they come first? Are you doing everything you can to assure your partner that they are being heard? Are you taking time to make sure that their interests and hobbies are fulfilled as much as yours? Do you spend equal time between your friends and family as theirs? If you answered no to any of these questions read on! Can you remember back to when you and your significant other were first together? What did you do back then? How did you court each other? What did you do when you were first dating? Show each other appreciation and gratitude. How often does your partner do something small that’s perhaps routine and even invisible? Do you thank your partner, express gratitude and appreciation? The more often you express gratitude for the small things the more your partner will feel appreciated and that helps create connection through emotional intimacy. Plan date nights and couple time. Schedule time together, on a calendar, just as you would any other important date. Relationships need maintenance, connection requires upkeep. Date nights, afternoons off playing hooky, movie nights, weekends away. Compliment each other. Remember the old days when you always told each other how great you look, how proud you were of each other’s accomplishments. Recapture those moments now with a small compliment each day. Reach out to each other throughout the day. Text messaging has made it easier than ever to leave each other love notes but don’t forget good old fashioned phone calls and hand written and hidden love notes. Express interest in each other’s lives. You used to know what was going on in each other’s lives. You used to hang on each other’s every word about your day and how things went. Spend time reviewing your day with your partner. But not with the cliche quesions like, “Hi honey, how was your day.” Ask provocative and connecting questions like, “What was your favorite part of today?” or “Did anything happen today that you wish you could change? Respect. Back in the day, when you first got together, you automatically respected your partner. Now, as time has passed, the respect has waned. Maybe you aren’t as courteous as you once were or maybe you now question some of the decisions your partner is making. Regardless, offering each other respect is a great way to deepen connection. Read more about Respect here. Physical Connection. Hugging, snuggling, kissing, and touching all help create connection through the production of oxytocin. Oxytocin is affectionately called The Cuddle Hormone or The Bonding Hormone, when released it creates a feeling of love and connection. Sexual intimacy is important in a healthy relationship and so is casual physical connection. And perhaps most importantly, plan time to talk. Plan for a time to discuss your relationship when you aren’t tired, angry, or under the influence. These discussions aren’t supposed to be painful, they’re supposed to be creating connection. Take the time to talk about where you want the relationship to be in a week, month, year. Talk about what you want to achieve in your relationship, the problems you want to solve, the misunderstandings you’ve had. 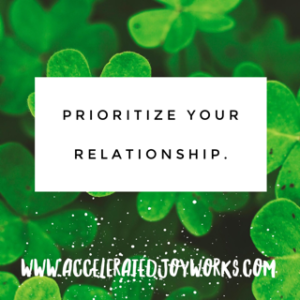 Need help creating a plan to prioritize your relationship? Schedule a session today. JoyWork Suggestion: Create a plan for the next 30 days to connect with your partner. Let me know how you’re doing on the Accelerated JoyWorks Facebook page or in the comments below. Leave me a comment below if you have any thoughts or questions. You can also let me know if you have a subject you would like me to address in the next article. Feel free to share this article with your friends and family or anyone whom you think might benefit. This entry was posted in Healthy Relationships, Uncategorized and tagged Building Trust, Communication, Connection, Emotional Intimacy, Happiness, Healthy Relationships, Physical Intimacy, Prioritize your relationship, Respect. Bookmark the permalink.